Antique brass accents bring warm depth to the oil-rubbed bronze finish of this four-light pendant. Demanding attention in an entry or dining room, this four-light pendant features a rich oil-rubbed bronze finish highlighted with beautiful antique brass finish knob details. A mesh drum shade rests within, offering a rustic or industrial edge to contemporary decor. 20" wide x 13" high. Takes four maximum 60 watt A15 clear fan bulbs (not included). Oil-rubbed bronze finish over metal construction. Antique brass knob finish accents. Metal mesh inner shade. This is a great lamp except that the two screws they give to secure the fixture can be cumbersome to align and grab to screw a nut in place. Update your dining room with the dramatic flat domes of the Libra pendant lightcomplete with clear glass shades adorned in silver leaf with polished stainless accents. Four candle-like lights are arranged at the center of the rounded metal frame of this four-light steel foyer pendant. 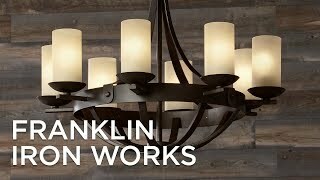 Add designer lighting style to your home with this adjustable multi swag chandelier featuring four walnut finish natural mica mini pendants. Featuring an asymmetric cube shapethis four-light cage pendant light has a distinct style that will make it a focal point in your room.